Remodeling Services: Upgrade & Replace Windows in Easton, MA | Boss Services Inc.
Home improvement projects should not just make your home look better, but should also make it function and perform better as well. One way to make improvements that actually add value to your home is to hire a home improvement contractor to upgrade windows to energy-saving materials. If you have wood windows in your home, you are likely losing a lot of money each year in heating and cooling costs, as they just do not have the ability to provide the thermal protection required to prevent heat from transferring through. In fact, studies show that homeowners who upgrade windows in Massachusetts or anywhere else in the northeastern states, can recover the money invested to replace windows in Easton by as much as 75 percent when they sell their home. On top of that, the energy savings gained by replacing old, wooden windows with brand new energy-efficient windows, will actually pay for itself in lower utility bills in several years. So whether you are doing remodeling services so you can sell your home or just so you can enjoy it more, you will be able to recover your investment when you upgrade old windows. As you consider your options with your local home improvement contractor, you will hear a couple of terms that you might not be familiar with regarding windows. Replacement windows are an interesting type of home improvement. They are not recommended for homeowners who have wooden window frames, as it is not a complete replacement. The only thing that gets replaced in the window is the glass and any moving parts. The framed part of your window remains, which makes it cheaper to do, but it also is not a true upgrade to windows. 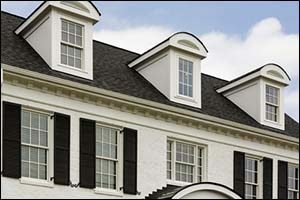 If your window is bad, as in cracked, tweaked, broken, rotted or just really old, you should not use replacement windows. Instead, you should use what are known as new construction windows. While your 20 year-old home is definitely not “new construction,” that is just the name of the type of material used to replace windows in Easton that are worn beyond repair or use. This type of upgrade to windows includes the glass, the moving parts and the frame. While repairs can be done in some situations, it is important that you don’t try to fix a big problem with a band-aid. Not only will it not work, but you will spend money on the repair and then have to spend more when it comes time to do a replacement or new construction window remodeling services anyway. However, if your windows are old and have wooden frames, it is highly suggested that you consider making an upgrade to windows that are more energy-efficient. Ask your home improvement contractor who is handling the rest of your remodeling project about your options and weigh the advantages versus the cost. When is the Best Time to Upgrade Windows? Obviously the worst time to upgrade windows to more energy-efficient versions would be in the middle of a snow or rain storm. That being said and this being New England, there really is no “best” time to upgrade or replace windows in Easton, MA or anywhere else in the northeastern region. If you are working on a larger remodeling project with a home improvement contractor, then go ahead and upgrade windows also at that time. Window technicians do installations year-round, regardless of the weather. Just know that you will get better results in mild weather conditions when the caulking has a better chance of setting. Well, no, you don’t need to hire a professional. You could go down to your local home improvement shop and buy some windows. However, for best results you should hire a professional. This is true whether you decide to completely upgrade windows or simply replace windows in Easton. Professional window installers are experts in their field and they have all of the tools, knowledge and skills required to do a professional quality job. If you want great results that will improve the value of your home and make the rest of your remodeling services project a success, then go with the professional. If you live in the Easton or anywhere in the Massachusetts area, contact Boss Services, Inc. for a FREE quote to upgrade or replace windows. In addition to providing window installations for our clients, we are a full service home improvement contractor and remodeling service, specializing in everything from windows and doors to roofing and everything in between. Give us a call at (508) 297-0635 to schedule an appointment or to learn more about our services.